Swedish scientists claim LENR explanation break-through | Mats Lewan: The Biggest Shift Ever. 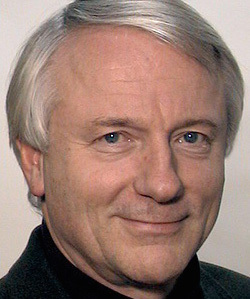 Rickard Lundin, credit: Torbjörn Lövgren, IRF. Essentially no new physics but a little-known physical effect describing matter’s interaction with electromagnetic fields — ponderomotive Miller forces — would explain energy release and isotopic changes in LENR. This is what Rickard Lundin and Hans Lidgren, two top level Swedish scientists, claim, describing their theory in a paper called Nuclear Spallation and Neutron Capture Induced by Ponderomotive Wave Forcing (full length paper here) that will be presented on Friday, October 16, at the 11th International Workshop on Anomalies in Hydrogen Loaded Metals, hosted by Airbus in Toulouse, France. The resistors in Rossis E-Cat are wound in non-overlapping coils inside the reactor. It is not clear to me if they were there parallel solenoids parallel to the tube axis in the Lugano version like was in earlier E-Cats or if they were all wound around the volume, with a common axis. In both cases, feeding with three-phase current, even if it is only a short pulse at the end of each half-period, the coupling to the central region will be very low. Fig 5 in the Lugano report shows the measured spectrum. The PCE can measure (with diminishing precision) up to 100 harmonics (5 kHz) and the most important of them are contained within the 20th harmonic (1kHz), which can be compared to the frequencies of the order 10^13 Hz discussed in the RL&HL paper. The resistors are not suited for exciting waves, but they work well as resistive heaters! But that will hardly accelerate 7Li+ or 2H+ to spallation energies! Fig 5 also reveals that the PCE is overloaded, i.e. the measurements are not fully reliable. At lower currents, the pulse shape is shows the end of a decreasing sinusoid ending at zero, but here the top is flat. The instrument is protected from too high currents i(t) and the reading is cut. The currents in the coils are hagher and with thwem the input power. This is an exaple of a process not due to a nuclear process. The PCE-830 is a good instrument, but it is difficult to measure power when the current is peaked and phase shifted close to 90 degrees from the voltage. How would it be with an adequate antenna? Could the RIToN process work? It is not unusual to heat fusion plasmas with waves tuned to resonances in the plasma, with success. The problem is that to avoid too much losses, the plasma must be kept away from the walls, which is difficult to do in a low energy metallic lattice. The energy needed for spallation is also higher than the Coulomb barrier, which was the obstacle LENR was supposed to overcome. Can it even be named LENR when we need a few MeV particle energy? Some people doesnt see the forest because of all trees. Again thanks Mats!! The idea of moving a neutron from one nucleus and put it at a lowe renergy level in another nucleus, thewreby releasing energy is interesting, but the comparison to Rossis E-cat is irrelevant, the experiments are not reliable with the misuse of power meter etc. What fraction of the input power is close enough to the resonsnce fequency to contribute? What fraction of the produced neutrons end up as planned and how many are lost in other reactions or to the surroundings? What fraction of the reseased energy has the right frequency to enhance the neutron production? Is it realyy possible to get a significant power excess from this scheme? Nothing could be more uninteresting than this.